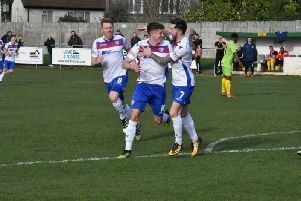 While there may have been a hint of disappointment around Hayden Road last weekend following AFC Rushden & Diamonds’ 1-1 draw with Lowestoft Town, there was one obvious positive for manager Andy Peaks. It had been six long weeks since captain Liam Dolman had featured for Diamonds but he finally made his return to the heart of the defence following an achilles problem. The centre-half duly collected the man-of-the-match award but, more importantly, came through the game without any reaction. He will be in line to feature again when Diamonds head to bottom side Bedworth United in the Evo-Stik League South Premier Division Central at the weekend. And Peaks insists the only way Dolman will get his match sharpness back is by playing. “Having Liam back was the massive positive to come out of last weekend,” the Diamonds manager said. “He can play better than he did and he will be the first to admit that. “But he got better as the game went along and he will certainly go into this weekend a lot sharper. “He came through a week of training, he felt good, he wanted to play and we wanted to get him back into the team because he is a good player and he is the captain of the club.